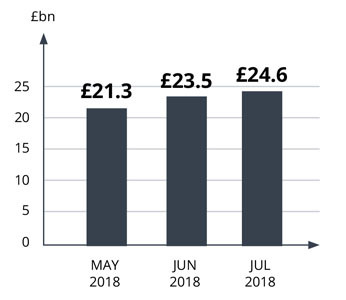 Just ahead of the Bank of England's decision to raise the base rate by a further 0.25%, the second quarter of 2018 saw over three quarters of remortgaging applications via intermediaries result in completion. The 'Mortgage Market Tracker' released by the Intermediary Mortgage Lenders Association (IMLA) said that for the second time this year, Q2 saw an increase in the number of mortgagees endeavouring to protect themselves from forecasted base rate increases and benefit from more affordable deals. Executive Director of the IMLA, Kate Davies, was quoted as saying: "The last 12 months have seen the end of a decade of record low interest rates that many borrowers have become accustomed to. The Bank of England's response to managing rising inflation had been widely anticipated by the industry and consumers . . . "
The research reveals that the average price of a house near a primary school rated 'outstanding' in England was 16% (£37,000) higher than one nearer a school rated 'good', and 30% (£61,000) higher when compared to a home in the catchment area of a primary school only rated 'inadequate' or 'requires improvement'. According to the Office for National Statistics (ONS), UK housing values added £40bn to the net worth of the country's assets in 2017. Overall land values added an additional £450bn. With UK land now worth £5.4 trillion, this equates to 53% of all the wealth found in the country, an increase of a third in net assets since 1995. This figure is now just shy of the record value of 53.3%, which was recorded by the ONS back in 2006 and 2007, just prior to the global financial crash. "July saw steady growth in gross mortgage lending, driven largely by remortgaging as homeowners locked into attractive deals in anticipation of the recent base rate rise.""